Hau'oli Makahiki Hou from Poipu, Kaua'i! 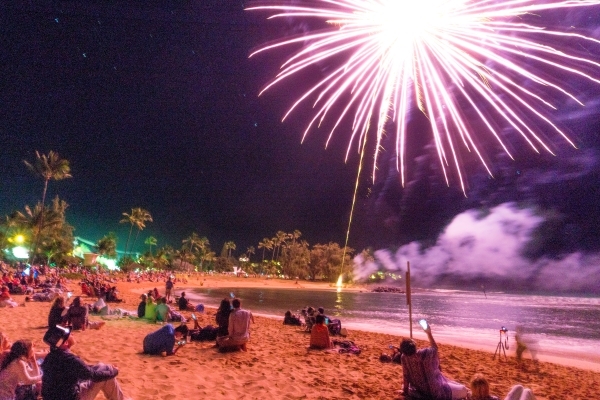 If you are ringing in the New Year on Kaua'i, Poipu Beach is the place to be! Every year, the Poipu Beach Resort Association hosts an awesome New Year's Eve Celebration at Poipu Beach Park from 5-9pm. The festivities includes a family-friendly movie and an amazing fireworks show. The best part? It's a free event! There are also a variety of food trucks and vendors lined up to keep bellies happy. Many of our favorites include: Kickshaws, The Fresh Shave, Chipwrecked, Kauai Poke Co, Rafael's Aloha Tacos, Ono Pops, Sumiko's Snacks, and many more. If you are in the mood for sitting and dining in instead, just across Hoone road, Brennecke's Beach Broiler is the perfect beachfront restaurant offerring a full view of Poipu Beach Park. Try their coconut shrimp -- so ono! The event does not officially start until 5pm, however, the beach park will be open to beach goers during normal day light hours. A family-friendly movie will begin once the sun sets followed by the fireworks display just as the credits roll. Seating for both, the movie and fireworks, is open seating so be sure to bring your beach chair or blanket and pick your spot early.